I was not the only one holding this opinion. Sorbara has long been considered the best Lambrusco region, with the most elegant expression, and Chiarli is the very first Lambrusco house, dating back to 1860. Fondatore is its link to the past, when Cleto Chiarli would add partially fermented juice to his Lambrusco just before bottling it. As indicated on the label, Chiarli Fondatore undergoes “Fermentato in Bottiglia” and at one time it was one of the few Lambrusco to be produced in this way. Was it hubris that encouraged me to pronounce a bottle-fermented Lambrusco superior to all that lowly stuff churned out by cuve close? Did I imagine fermentation in bottle to be intrinsically superior for all styles of sparkling wine? Maybe, but that is definitely not true. We all learn and it has been a long time since I have had either the urge or opportunity to study Lambrusco in depth (more than 15 years), so this was a lesson that has been very late in coming. It is not as if Chiarli itself has gone downhill. Cleto Chiarli Pruno Nero is the second best Lambrusco I have tasted in many a year, but that is a full-throttle, deep-coloured semisecco produced by cuve close. However, the days of Chiarli Fondatore being in a class of its own have long gone. There is no getting away from it, Lambrusco has a lousy global reputation and from the results of my tasting, it is a reputation that is well deserved. When I approached the various Lambrusco consorzi, I was totally honest and promised to be supportive if I could find wines of a sufficiently high standard. However, when faced with just 30 Lambrusco, it was clearly not representative of the entire industry, yet the conundrum was that no consorzio is allowed to give any individual members preferential treatment. The smartest consorzi usually manage to get around this by including the very best wines within a large representative range, but with just 30 Lambrusco and well aware that I needed to taste the very best, the only logical assumption I could draw was that it must be chock-a-block full of top Lambrusco from the most serious producers. If this was true, then only six or 20% worthy of recommendation merely served to confirm the truth of Lambrusco’s poor reputation, especially when the rest were so dire and fault-ridden, but I think it was more of a hotchpotch that was compiled in haste. Even so, to find so few good wines is still depressing. Not withstanding this, it did shift my view that Sorbara and Chiarli Fondatore were respectively the best Lambrusco DOC and wine because clearly that honour now goes to Castelvetro and Corte Manzini’s L’Acino. The low esteem in which so many wine drinkers hold Lambrusco is the primary driving force behind the fairly recent emergence of Metodo Ancestrale. Some are disgorged, but most are not, and there are two schools of thought about how the undisgorged version of this bottle-fermented Lambrusco should be served: one is to gently shake the bottle before pouring it, while the other is to let the spent yeast lees settle and pour it clear. I’m of the opinion that the first option is fine for some beers, but removes all elegance from any sparkling wine. Unfortunately, this is pretty much academic as the Lambrusco Metodo Ancestrale I tasted did not have any elegance in the first place. If Lambrusco is to survive in the modern world, the fresher, fruitier, more vibrant cuve close wines should dominate, even at the top end of its price category. It was the poor reputation of Lambrusco that attracted the more widespread of Metodo Ancestrale, as its bottle-fermentation production method demands a higher price. Unfortunately so many Metodo Ancestrale stank and were so disgusting that higher prices can only be counter-productive, making consumers think that Lambrusco is not only poor in quality, but also overpriced. There is a place for Metodo Ancestrale in the Lambrusco market, but only if it is clean and truly outstanding. However, it is not just Lambrusco Metodo Ancestrale that has to improve, so does most Lambrusco cuve close. The entire industry needs to reinvent itself if Lambrusco is to survive as a financially viable product in the 21st century and if it can reinvent itself, Lambrusco could enjoy a Prosecco-like surge in sales and reputation. Current closures range from the regular capsule & cage found on almost every other sparkling wine to cork & agrafe, normal (but fatter) cylindrical cork and normal (but fatter) cylindrical cork tied down with string. These last two are court cases waiting to happen. I hated opening such bottles and I open bottles for a living. Extracting a cork that bloats out to double its width as the corkscrew edges it above the lip of the bottle is neither easy, nor enjoyable. Such extreme difficulty and displeasure should in itself should be enough to ban these types of closure because they actively discourage repeat buys, but why no one has been forced by exertion to slip and injure himself or herself, and sued the producer is a mystery, especially in litigation-happy USA. Furthermore, such a mishmash of closures does nothing for the product identity of Lambrusco. The ideal closures to give all Lambrusco a uniform stylistic presentation and to make a quality wine statement would be the capsule & cage with an easily removable foil cap. Updating Metodo Ancestrale should be paramount. It is one thing to enshrine the principles of an historic method, but quite another to restrict every aspect of its production to the crude technology of that era. The essence of Metodo Ancestrale is the addition of partially fermented juice to create a frizzante-strength mousse through refermentation in bottle. Whether the objective was to create a fizz or simply to preserve the wine, we will never know, but one thing we can be sure about: the aim was never to produce a murky liquid. Those producers who recommend giving the bottle a gentle shake before opening are not just wrong, they are pretentious or lazy, while those who are careful to pour the wine clear are missing the point. If the original producers had the knowledge (disgorgement) or technology (transfer and filter), does anyone think for a single moment that they would not use it? Of course they would, and the brighter and clearer they could produce their Lambrusco, the prouder they would have been. If there are any producers of Metodo Ancestrale who can honestly claim not use any modern technology, not simply winery equipment such as presses, pumps and refrigeration, but basics like electricity supply, I would be surprised, but I would leave them in their Luddite paradise. For all other producers, however, I would make it obligatory to achieve a commercially acceptable limpidity in these wines. I would also look at setting more stringent conditions of production to enhance the Ancestrale part of Metodo Ancestrale, with a view to a future application for DOCG, such as minimum age of vines, lower vineyard yield, lower pressing yield, a dedicated bottle, Brut only style etc. Old wines should be banned. 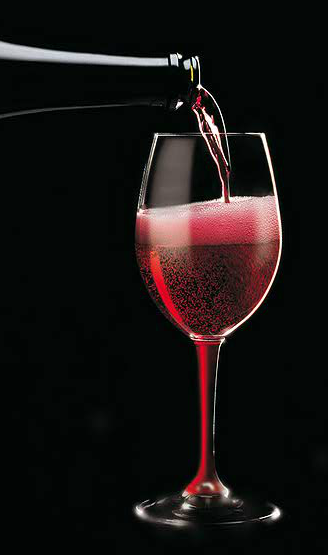 Lambrusco does not have the potential longevity of Shiraz, which may be matured for many years before bottling as a sparkling red wine. Lambrusco should be fresh, yet the most prevalent faults included dull colour with brown reflections and wines that tasted old, dull or oxidised. This could be eradicated if it was mandatory to bottle all wines within 6 months of harvest. An indication of vintage should be mandatory. Most Lambrusco is non-vintage and my only reservation about the wines recommended below is that they are all non-vintage. If there were not so many old and faulty Lambrusco floating around, the non-vintage issue would not be of such concern, but there are, which makes worry what a consumer will encounter when following one of my recommendations. Will a different blend of the same wine be anywhere near as good or, worse, what if someone picks up exactly the same blend in a few years when it is old and past it? An indication of vintage is not a guarantee of quality. I tasted three vintaged Lambrusco and they were all bad. However, an indication of vintage does at least guarantee what the wine is and how old it is, and that helps consumers to make an informed choice. Back-blend the wine after second fermentation, prior to filtration, with unfermented juice to increase the residual sugar, lift and freshen the aromatics. As the colour is all over the place, here is a wild thought: become the first appellation in the world to set a minimum colour density for the red wines and a maximum density of colour for rosé (to emphasise elegance). I was deeply disappointed not to have tasted a greater number of Lambrusco and, more importantly, not to have found more Lambrusco I can enthusiastically recommend, but these six do at least demonstrate that delicious Lambrusco can be found. If all Lambrusco wines were as good as Corte Manzini Lambrusco Grasparossa di Castelvetro L’Acino, Lambrusco could be serious competition to Prosecco in the bars of swinging Europe. Although technically non-vintage, I was told that 2014 was the year of harvest. Super-fresh and zesty, with lots of rich, dry’ish fruit. This non-vintage is in fact 2013, but although a year older, it is just as fresh, fruity and full of energy, with vibrant, purple foam. Bags of lovely, vibrant, sour-cherry fruit riding on the crest of a magenta-coloured, foam-capped wave. A lovely, deep, summer-fruit colour with a purple, foaming mousse, this Lambrusco is fresh and rich with tangy cherry and cranberry fruit on the palate, and the residual sugar is so well balanced that it does not taste sweet per se, just rich. This is a lovely dry and lively Lambrusco with a twist in its tail in the form of raspberry-rippled chocolaty fruit on the finish. The second-best wine in the tasting and definitely a potential Silver medal. 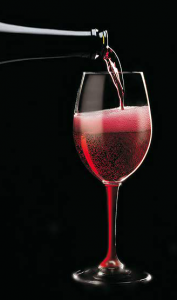 Unlike the light-red Fondatore, this Lambrusco is meant to be a rosé and has an elegant, pale-peach colour. Despite its old-fashioned presentation, the style is modern, with a very fresh, clean, fruity style and notes of cherry, cranberry and raspberry on the aftertaste. Essentially dry. The new “class apart” Lambrusco. There is no contest as far as depth of colour, richness and purity of fruit is concerned. The sumptuously rich, purple-coloured, pincushion mousse maintain a fabulously creamy cordon in the glass. It is just so delightful, it really is quite the most extraordinary Lambrusco I have ever had. If this is not Gold medal quality Lambrusco, then nothing is.